Kisami Ohama Beach is our “home beach”. Just a 4 minutes walk and you’ll be skipping into the sea. From Retreat wabi-sabi walk back down the dirt road, turn right at our large parking area, and you will see another dirt road on your right, that’s the short cut to the beach! You will pass White Beach Hotel and Restaurant and Sunny Side Cafe along the way. During the peak summer months, from Mid-July until the end of August, there will be life-guards on duty from 8 am to 5 pm. If you are not a confident swimmer, we suggest you enjoy the ocean while the lifeguards are there to keep you safe. There will be a swimming zone and a surfing area, go anywhere outside of these assigned areas and you will be chased out by the life-guards. If you have a lot of experience swimming in sometimes rougher seas and don’t want to follow the rules laid out by who some people call “the fun police”, then we suggest you get in as much beach time while the life-guards are off duty, before 8 am and after 5 pm. Or come to Shimoda anytime from September to Mid-July. Although some people are annoyed by all the rules while the life-guards are on duty, I have the utmost respect for the incredibly hard-working men and women who without any doubt prevent drownings. The seas can at times get rough, especially when there are typhoons approaching. Other times the sea can look like a calm glassy lake, the currents, waves and winds, change day-to-day. If the waves are big, and the lifeguards are being extra strict it may be a good idea to explore some of Izu’s smaller bays where the beaches are more protected from incoming swells. 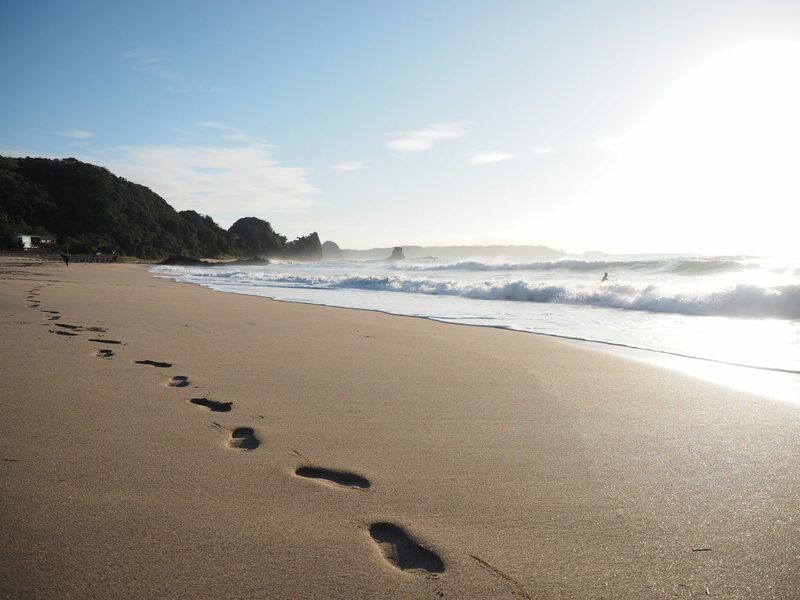 On big days we suggest you swim at Nabeta Hama (beach), about half-way to Izukyu Shimoda Station or Yumi-ga-hama (Beach) on Izu’s most southern tip. Both beaches can be reached by bike, bus, taxi, or car. On weekends during the high season, the bigger beaches can get pretty busy but it is never very difficult to escape the crowds. If you are looking for a more a little more tranquility, just choose 1 beach to the left, Maiso Beach is on the other side of the river, or 1 beach to the right, go through the tunnel and you will find a much quieter beach. Mid-summer Taeko from Taenoyoga provides early morning yoga classes on the beach. If you get there even earlier you will be able to watch the sunrise. Take care and stay salty!